In a medium sized bowl add diced apple, and one tablespoon of lemon juice. Stir lemon juice into apples coating them well. This will help keep the apples from turning brown. Add chicken, sliced grapes, diced celery, and pecans. Mix well until everything is mixed through. Add 1/2 cup mayonnaise, if the mixture is too dry you can add another 1/4 cup of mayonnaise. Add salt and pepper to taste. Allow flavors to marry in a covered bowl in the refrigerator for about 1 hour before serving. To prepare sandwich like Arby's use thickly sliced wheat bread, add a couple of slices of green leaf lettuce, and add about 1 cup of chicken salad to the sandwich. While they do not toast their pecans, I think you could easily bring this salad to the next level by toasting the pecans in a skillet on medium high heat just until they become fragrant. Allow the pecans to cool completely before preparing the chicken salad. 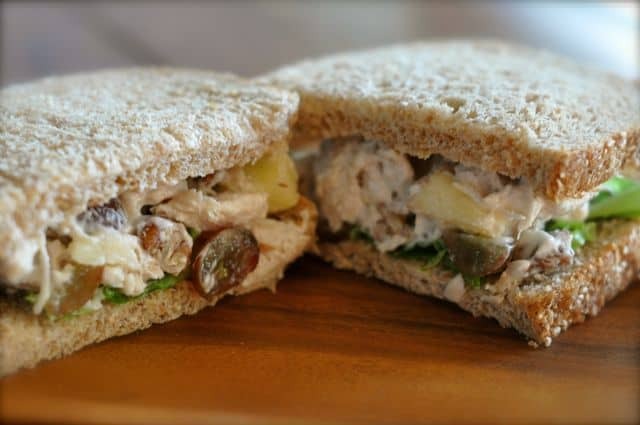 You don’t need to limit yourself to just a sandwich with this chicken salad, you could put this in a large tortilla for a wrap. This would go well in a submarine bun, I loved this with toasted sour dough bread. Honestly, this goes well simply scooped out and placed on a salad. If you don’t happen to have any grilled chicken around, you could use left over chicken that you may have from a baked chicken.